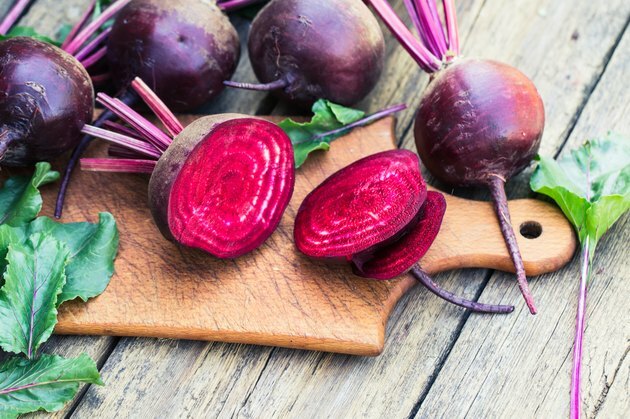 Can You Lower Cholesterol by Eating Beets? Beets contain a number of essential nutrients, including fiber, folate, vitamin C, potassium and manganese, and beneficial plant chemicals. Because of this, they may provide health benefits. Eating vegetables, in general, may help lower cholesterol levels, according to a study published in the "Journal of Horticultural Science & Biotechnology" in 2009. Whether beets, in particular, have a similar effect is still not clear, although some preliminary evidence indicates that this might be possible. A study published in "Farmacia" in 2011 found that feeding rats with high cholesterol an extract made from beets lowered their total cholesterol and triglyceride levels while increasing their high-density lipoprotein, or good cholesterol. The study authors suggest the beneficial plant chemicals in beets may be responsible for this effect. More research is necessary to see whether these potential benefits occur in people who eat beets as well as in rats and how much of these vegetables you would have to eat to realize any potential cholesterol-lowering benefits. The soluble fiber in vegetables, such as beets, may help lower low-density lipoprotein, or "bad" cholesterol, according to a study published in "Current Atherosclerosis Reports" in December 2008. Each cup of beets has 3.8 grams of fiber, or 15 percent of the daily value. Of this, about 1.6 grams consists of cholesterol-lowering soluble fiber.